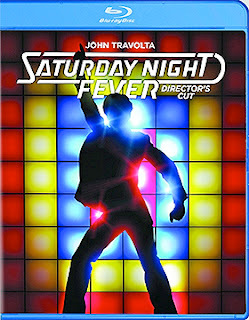 Paramount Home Media will be spinning the disco ball and strutting to the beat of the Bee Gee’s “Ah, ha, ha, ha, stayin' alive …” on May 2 with the release of John Badham’s Saturday Night Fever: The Director’s Cut on Blu-ray. This is not your ordinary “anniversary” edition as Paramount has gone the extra mile by including not only the original theatrical cut, but a director’s cut of the film as well — available for the first time and clocking in with an additional four minutes worth of footage not previously seen. John Travolta owns this movie as Brooklyn’s Tony Manero, a young man with no future and few skills, except when he is on the dance floor. He’s vibrant, electric and it is a performance that was worthy of an Oscar nomination for Best Actor in 1977 … quick, can you remember the actor that won that year? 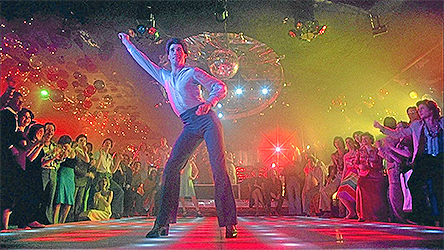 It is 40 years later and you can likely only remember Travolta as Tony (it was Richard Dreyfuss who won for his performance in The Goodbye Girl) … the following year it would be Travolta in Grease, then in 1980 Urban Cowboy, followed by Blow Out in 1981 and then acting “darkness” (a mindless nothingness for a decade and a half) until his triumphant return to acting glory as Vincent Vega in Quentin Tarantino’s 1994 post-Labor Day release of Pulp Fiction (why oh why did it have to be released the same year as Forrest Gump and The Shawshank Redemption). Also on the release calendar for May 2 from Paramount Home Media are DVD collections of 4400: The Complete Series (a 14 disc set) and Vega$: The Complete Series (18 disc set). 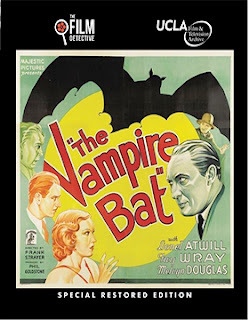 The Film Detective will be bringing a Blu-ray edition of a newly restored version of director Frank Strayer’s 1933 horror classic, The Vampire Bat, to market on Apr. 25. Tod Browning’s Dracula, with Bela Lugosi, was such a hit in 1931, that it was only natural that the theme would be continued. Add to that the success that Fay Wray and Lionel Atwill had with the summer of 1932 release of Doctor X and it was only movie gold that this winning combination would find their way to screen yet again (and again with Mystery of the Wax Museum … and all of this before Fay Wray became a legend with the film release of King Kong; both of these were also released in 1933). Bonus nuggets assembled by The Film Detective include commentary from film historian (and film maker in his own right) Sam Sherman and a newly prepared with session with co-star Melvyn Douglas’ son, Gregory Hesselberg. Arrow Video, with domestic sales and distribution expertise provided by MVD Entertainment Group, has selected May 9 as the release date for writer/director Frank Henenlotter’s 1988 cult horror favorite, Brain Damage. A new digital transfer from original film elements will be delivered to fans as a Blu-ray/DVD Combo Pack on that date. 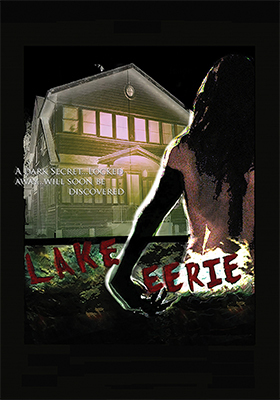 This indie horror film didn’t quite get the theatrical exposure necessary at the time of its initial theatrical run in the spring of 1988 to make it an instant genre-fan classic. That would come later with VHS and earlier DVD editions … it is the find of film that really, really grows on you. Bonus goodies included by Arrow Video are toplined by a new commentary from filmmaker Frank Henenlotter (Basket Case, Frankenhooker), new video sessions with the cast and member of the film crew and a Q&A session from the 2016 Offscreen Film Festival featuring filmmaker Frank Henenlotter. Also on the way from Arrow Video on Apr. 18 is a new 2K restoration of the giallo classic, director Emilio P. Miraglia’s 1971 film release of The Night Evelyn Came Out of the Grave. It will be available as Blu-ray presentation and can be viewed in either its original Italian language version or the dubbed English-language theatrical version. Lord Alan Cunningham (Anthony Steffen) is one nasty, demented individual. He likes to “invite” young women — especially those with red hair — over to his castle for torture and killing sessions as something of a cure for the affairs of his dead wife, Evelyn. But now someone is trying to turn the tables and drive him insane. He’s a murderer to be sure, but someone close to him is more than willing to go him one better. The third act exposes it all … and someone (not saying who) ultimately gets away with murder! 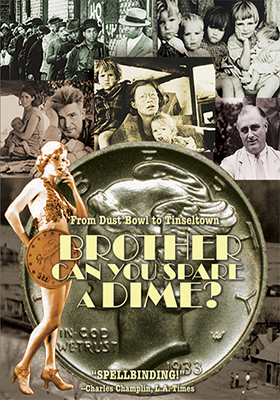 The Sprocket Vault announced this past week that writer/director Philippe Mora’s 1975 Depression Era documentary, Brother Can You Spare a Dime, will be digitally restored and released as both DVD and Blu-ray product offerings on Mar. 7. Filmmaker Mora, who would go on to direct such horror classics Howling II: ... Your Sister Is a Werewolf and The Marsupials: The Howling III, uses archived footage (clips from films, newsreels, etc.) to weave a fascinating — and entertaining — story about the life and times of living through The Great Depression. Bonus goodies include nearly hour’s worth of Pathé Newsreels from the period. Vinegar Syndrome Announces Its April 2017 Release Slate (Apr. 25): Double Exposure • Psycho Cop Returns And More! 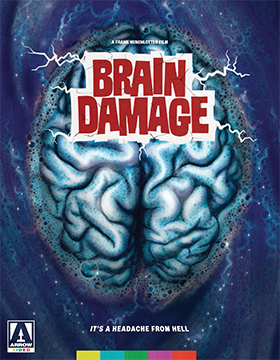 Vinegar Syndrome announced its April DVD and Blu-ray/DVD Combo Pack restorations this past week. Apr. 25 will be the street date. Leading the charge is a new 2K restoration (from original 35mm camera negative) of writer/director William Byron Hillman’s 1983 slasher film, Double Exposure, starring Michael Callan as Adrian Wilde, a photographer of models (aka: centerfolds ... there is plenty of flesh) who has bad dreams. It arrives as a Blu-ray/DVD Combo Pack. As genre fans know full well, nightmares in a slasher films is not a particularly good characteristic for a leading man, especially when hookers (“models”), including an uncover cop posing as one, are dropping like flies on the streets of Los Angeles. So is Adrian the killer? Or, perhaps, it is his stuntman brother, B. J. Wilde (the late James Stacy — Posse, A Swingin' Summer), who has issues of his own? Or is it just another Los Angeles slasher on the prowl! When Adrian sets his sights on Mindy (Joanna Pettet — Casino Royale, The Evil, Welcome to Arrow Beach) all bets are off. If he is the killer, then she is a goner, but if he is not, how can a man with horrific nightmares, who is just hanging by a thread, ever hope to protect her! It looks bad for Mindy either way. Bonus goodies include commentary with filmmaker William Byron Hillman, video sessions with cinematographer R. Michael Stringer and script supervisor Sally Stringer, a still gallery and an isolated score featuring the work of composer Jack Goga. 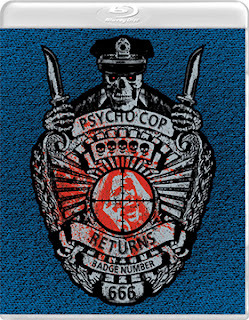 1993 direct-to-video release of Psycho Cop Returns … It too will be available as a Blu-ray/DVD Combo Pack. 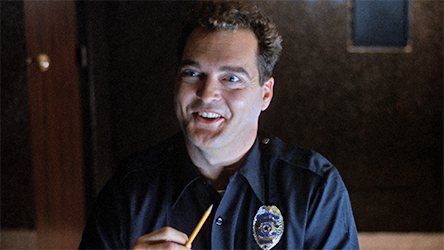 When police officer Joe Vickers (Robert R. Shafer), who is in reality a homicidal maniac — which we know from his last rampage (Psycho Cop, 1989) — gets wind of an after hours office party he knows just what to do. Genre fans will recognize the motif of an “office party” as the mechanism necessary to assemble a “victim pool.” We have strippers, building security, the guys throwing the party, office workers who stuck around for the fun and a lovely workaholic named Sharon (Barbara Niven) who have to run, hide or outwit Vickers … or die. Most die!!! 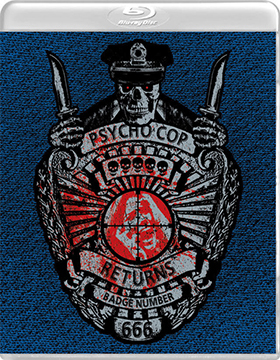 Vinegar Syndrome has restored Psycho Cop Returns (aka: Psycho Cop 2) to it full un-cut glory, or should we say BLOODY glory, plus there is commentary from director Adam Rifkin. Arriving on DVD on Apr. 25 from Vinegar Syndrome is a new 2K restoration of director Leonard Kirtman’s 1984 VCA Pictures production of Hot Flashes, starring Kristara Barrington as China Lee, with Crystal Breeze and Karan Summer as Glenda. Hot Flashes was shot on film (35mm) as opposed to video, which makes it one of the last of its kind to do so (see Paul Thomas Anderson’s 1997 film release of Boogie Nights to more fully understand the significance of an adult feature actually shot on film during this period). Rounding out the Apr. 25 restorations from Vinegar Syndrome is the latest in the company’s popular “Peekarama” double-feature series. This edition on DVD includes Ladies Night (1980, with Annette Haven and Lisa De Leeuw) and Her Wicked Ways (1983, starring Jesie St. James). Both films are 2K restorations from the 35mm negatives … bonus goodies include a video session with filmmakers Harry and Louis Lewis. Labels: DVD and Blu-ray Release Report, Vinegar Syndrome Announces Its April 2017 Release Slate (Apr. 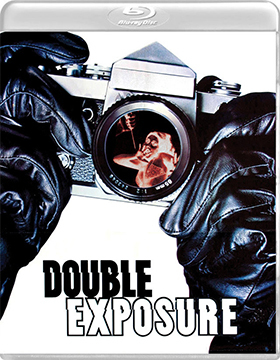 25): Double Exposure • Psycho Cop Returns And More! The word “despicable” is probably not strong enough a word to describe the Jan. 18, 2017 online video hit piece that tmz.com posted attacking director Lasse Hallström’s theatrical release of A Dog’s Purpose. PETA (there is nothing “ethical” about this organization’s actions in this matter) immediately called for a national boycott of the film. 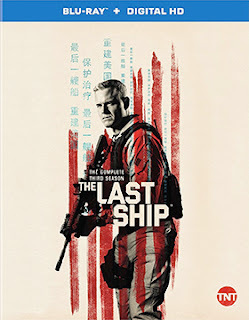 Universal Pictures was blindsided and forced to cancel the film’s scheduled red carpet premiere. The film subsequently opened on Jan. 27, but the damage had been done … the opening weekend box office take was well below expectations. The video in question was shot on the set surreptitiously — a blue-screen water tank filmed sequence — during the film’s production in 2015 and purports to show Ellie (played by Hercules), the German Shepard in the film’s second segment, being horribly mistreated — nearly drowned. The video, as it turns out, was heavily edited and taken completely out of context. That didn’t stop tmz.com from posting it or PETA calling for a boycott of the film. The dog, according to reports, had been trained to shoot the pivotal river sequence (the magic of film — the dog is never actually in the river) on one side of the pool. When lighting requirements called for a shift in location, the dog became nervous about the new location. It was all worked out and Hercules was never in any danger (subsequently reported in the Hollywood Report on Feb. 4). 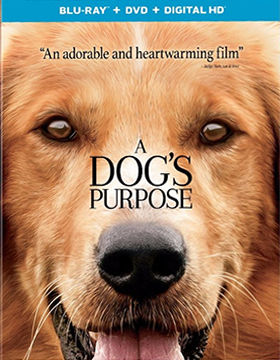 Well guess what, the opening weekend audiences, who either didn’t get the word about the boycott, or think that PETA often goes too far in their self-righteous indignations, told their friends — that’s called “word of mouth” — what a marvelous dog-loving film A Dog’s Purpose happened to be and in subsequent weeks the box office grew and grew and grew. They just kept coming and now receipts currently stands at over $60 million (and it is still playing on nearly 1,500 screens nationwide)! Universal Pictures Home Entertainment announced this past week that both DVD and Blu-ray/DVD Combo Pack editions of A Dog’s Purpose will be available on May 2 for everyone to enjoy. The ARR for that date is 95 days. This is a tale about a boy and his dog … and his dog … and his dog … and his dog — the spirit of the same dog reincarnated four times. The film is an adaptation of W. Bruce Cameron’s 2010 New York Times bestseller (nearly a year on the list). We first meet Ethan as a boy when his mother rescues a puppy from a pickup truck on a hot day — breaking the window and saving the dog’s life. They take the dog home — a Golden Retriever — and name him Bailey (who is voiced throughout the film by actor Josh Gad). The two, Ethan (played by two different actors during this period) and Bailey, grow up together. It is isn’t easy as Ethan’s father is an alcoholic, often abusive, the marriage breaks up, Ethan’s dreams are shattered (a series of horrible events), Bailey grows old and dies. But wait, Bailey is reborn as the aforementioned Ellie, a German Shepard, who grows up to become a police dog, working with a Chicago policeman named Carlos (played by John Ortiz). On one particular case Ellie saves a kidnapped little girl (the water sequence), but is killed by the kidnapper. 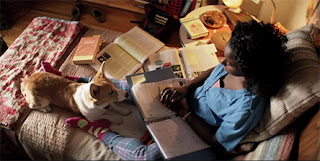 The next segment has Bailey reincarnated as a Pembroke Welsh Corgi, a cutie pie named Tino, who helps guide a pitiful, college-age student named Maya (Kirby Howell-Baptiste), from being a sad, lonely loser to a happily married young woman … and Toni too grows old during this time and dies. The last sequence brings us full circle back to an adult Ethan (played by Dennis Quaid), as Bailey is reborn as a Saint Bernard named Buddy. Buddy’s life is a living hell, and Ethan’s life is no bed of roses either as everything he dreamed about as a young man has been lost to him, including the love of his life, Hannah (Peggy Lipton as an adult). Bring Kleenex, you’ll need it, as Buddy (Bailey), lost and on his own, finds Ethan and the two reconnect. Buddy knows what to do … find Hannah and make things right. A surprise awaits Ethan that brings the film full circle. What a beauty! If you want a feel-good movie experience, A Dog’s Purpose is just that film!!! 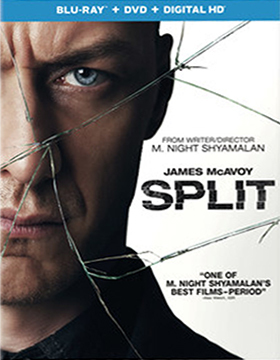 Writer/director M. Night Shyamalan’s box office hit, Split, will be making its way to the home entertainment marketplace on Apr. 18 as both DVD and Blu-ray/DVD Combo Pack offerings. The ARR for this mid-April release works out to 88 days and ticket sales were a robust $130.8 million. Teenagers Marcia (Jessica Sula), Casey Anya Taylor-Joy (Casey Cooke … and at an earlier age by Izzie Coffey) and Claire (Haley Lu Richardson) are being held captive by a group of 23 different people (possibly 24) in a very unlikely-to-be-found hiding place (a nice double twist in the third act). Is this a cult that is into young girls? No, it’s Kevin, maybe Dennis, or Barry, or maybe even Patricia, but they are all one in the same (played by James McAvoy — X-Men: Days of Future Past, Victor Frankenstein, The Last Station, etc. ), a kidnapper with multiple personalities. As the girls try to figure out ways to escape, they come to learn — from “sampling” each of the personalities — that there is one that can never come out, or “into the light.” That would be The Beast, a side of their captor that is without mercy or guilt … a creature so horrible that even thinking about The Beast can give one nightmares. So does our boy Kevin — and his friends — just run this little prison? No, he has a real-world job and he is even in therapy — Dr. Fletcher (Betty Buckley). The cat-and-mouse game builds to a climax and the day of The Beast finally arrives. We will tell you this much, The Beast is not nice. 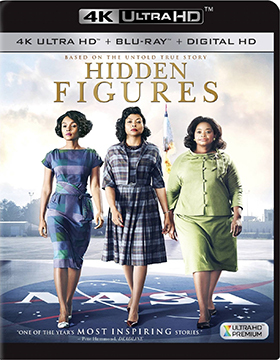 Writer/director Theodore Melfi’s Oscar-nominated film adaptation of Margot Lee Shetterly’s book on the “human computers” of the United States early space program, “Hidden Figures: The Story of the African-American Women Who Helped Win the Space Race” — which mercifully shortened for its theatrical release to just Hidden Figures — will be making its home entertainment debut on Apr. 11. The ARR is 109 days and box office receipts continue to grow and currently stand at $152.7 million … easily outpacing last year’s Best Picture-winner, Moonlight, by $130 million. That sort of tells you what theatre-goers thought of the two (voting with their wallets). 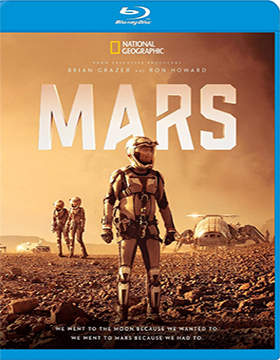 In any case, 20th Century-Fox Home Entertainment has DVD, Blu-ray/DVD Combo Pack and 4K Ultra HD/Blu-ray Combo Pack editions lined up for delivery to retailers on Apr. 11. The movie — as movies often do — takes a few liberties with Shetterly’s story about a trio of black women (played by Taraji P. Henson, Octavia Spencer and Janelle Monáe) working for our Mercury space program who were uniquely gifted with mathematical skills that were well ahead of the computer technology of the time. 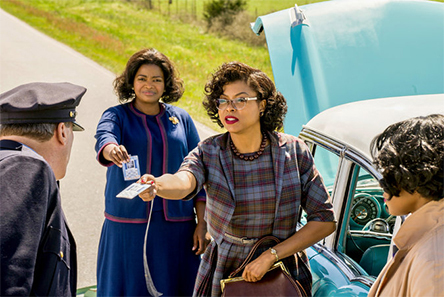 Because they were women — and black — they didn’t get the recognition that their male colleagues received during early days of the United States’ race for space. Melfi’s film, and Shetterly’s book, goes quite aways in setting the record straight. FilmRise, with sales and distribution support provided by MVD Entertainment Group, will be issuing a DVD edition of director Chris Majors’ supernatural chiller, Lake Eerie, on Apr. 11. 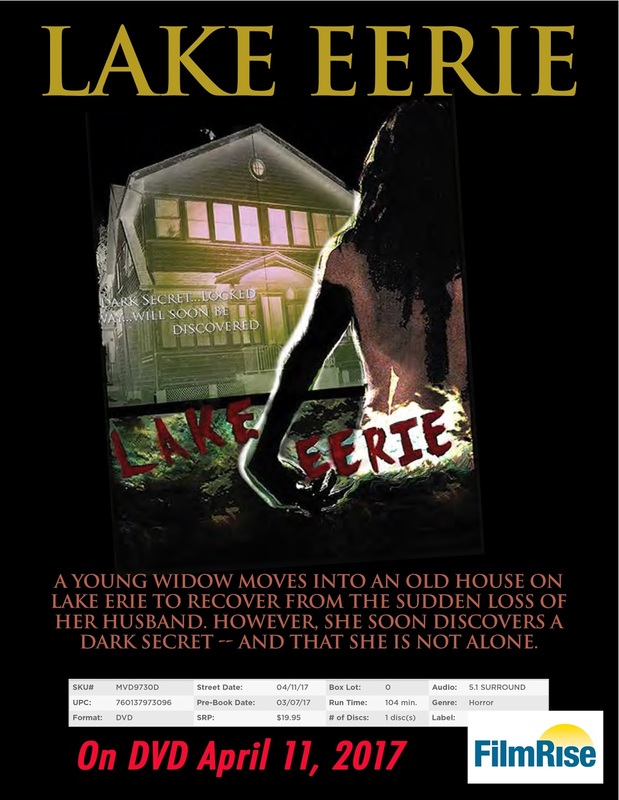 A recent widow, Kate (Meredith Majors), settles into a long-shuttered lake house in an effort to recover from her grief, but soon feels that something about the place isn’t quite right. It seems that the previous owner (played by Chris Majors) was a famous Egyptologist who vanished suddenly while on a dig. Is his spirit reaching out to her from another world … or is there something more sinister at play! Also on the way from Warner Bros. on Mar. 28 are five new film vault treasures making their debut on DVD. The theme is all about the ladies ... Fight for Your Lady (1937, with Ida Lupino, Margot Grahame and Jack Oakie), Girl in Every Port (1952, Groucho Marx, Marie Wilson and William Bendix), Ladies of the Jury (1932, Edna May Oliver), The Richest Girl in the World (1934, Miriam Hopkins, Joel McCrea and Fay Wray) and Smart Woman (1931, starring Mary Astor). Sony Pictures Home Entertainment will bring a three-SKU helping of the latest installment in the Underworld film franchise saga, cinematographer-turned-director Anna Foerster’s Underworld: Blood Wars, to market on Apr. 25. The ARR is 109 days and multiplex ticket sales chimed in at $30.3 million. 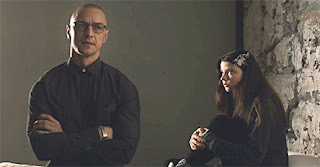 The vampires are on the ropes (Bill Nighy’s Viktor is gone) and the werewolves on the prowl for Selene, the “Death Dealer” (Kate Beckinsale), as she holds the secret to the whereabouts of Eve (her daughter), whose blood holds the secret to an eternal reign of werewolf hybrids. Although Marius (Tobias Menzies), the leader of the werewolves, is dispatched in the film’s finale (a nifty bit of “back surgery” by Selene), there are plenty of loose ends for a sixth entry in this series … stay tuned! 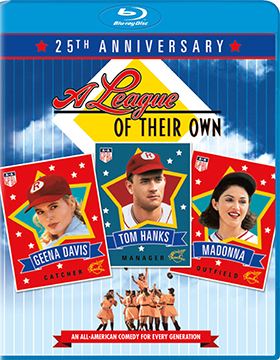 Also added to the release calendar this week from Sony Pictures Home Entertainment is the 25th Anniversary Edition of director Penny Marshall’s A League Of Their Own.